Stick to these golden rules to keep your linen favourites looking their best for office, island life and beyond. 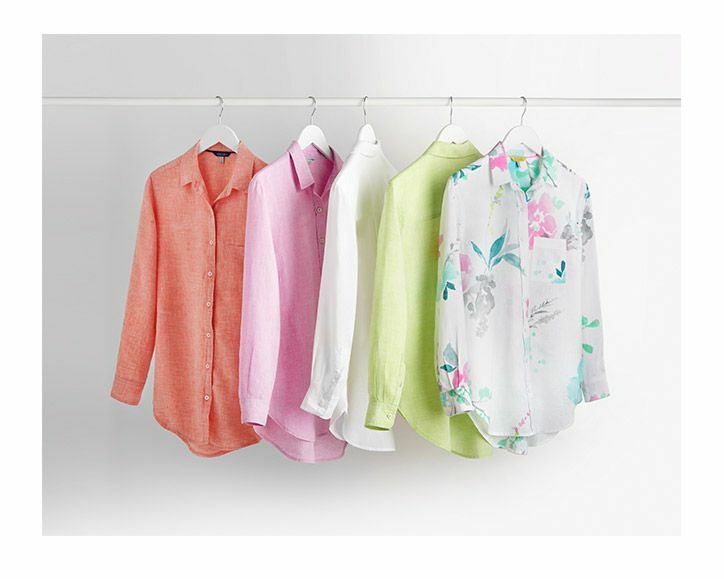 Holidays, staycations, boat trips and beach huts, nothing screams summer fun quite like a wardrobe packed with linen. 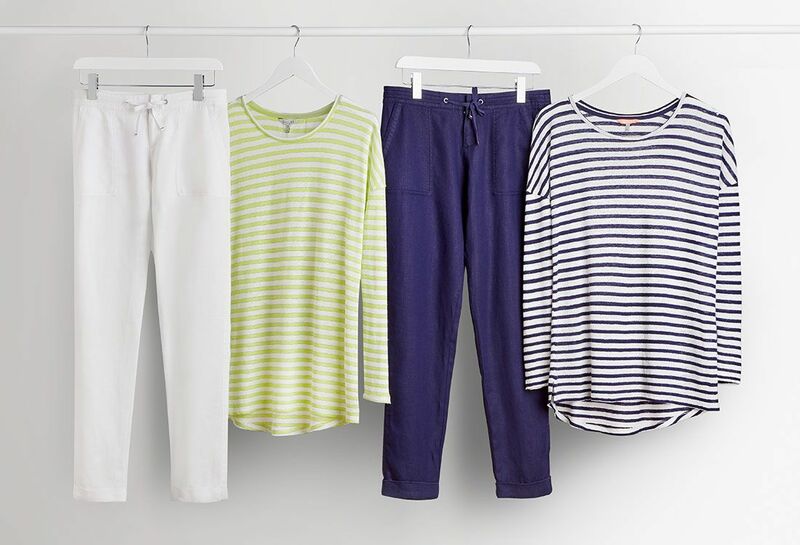 Getting dressed in this light and breezy fabric can make you instantly feel you’re traversing the rolling hills of Tuscany, cruising the French Riviera coastline, snoozing in a Greek island cove – you’ve got the picture! You needn’t be miles away to enjoy its benefits either, whether going about your day to day duties or on a jolly abroad, linen is the perfect investment for the coming months. Here’s how to ensure every piece lasts the distance. Always check the care label but a good rule of thumb is to avoid biological detergents, sticking to a non-bio on a gentle 30 degree cycle. Don’t crowd the washing machine with too many items, linen needs to move freely in the drum to avoid being twisted and pulled out of shape. Pick up some tissue paper, or dig out old polythene bags from the dry cleaners and pack your linen neatly to minimise suitcase creasing during the journey. Hang it up as soon as possible, the damp atmosphere of a bathroom post-shower is perfect – watch dents drop out before your eyes! Ring ahead and see if your room includes an iron, if not, snap up a travel one. Stick to a gentle swishing motion and never twist or scrub because you could damage the delicate fibers. Rinse thoroughly, ensuring all suds are out. Instead of wringing at the end, grab a big bath towel and lightly press and pat any excess water out. So reshape your garment when it comes out of the wash and dry flat, avoiding tumble dryers. Iron whilst still slightly damp, first on the wrong side to cut creases and then on the right side to enhance the fabrics natural sheen. Wire or ill-fitting hangers can cause marks and misshaping on shoulders and necklines so hang your linen lovelies on your best padded or curved wooden hangers. Always do up any top collar buttons, cuffs and then fasten every other button all the way to the bottom to keep edges neat and dodge annoying marks and creases when you take it out of the wardrobe. Linen travels well, it conducts heat away from the skin and is absorbent too, so you’ll always feel cool and refreshed in humid weather. The natural fibres are light and let the skin breathe so it doesn’t come much more comfortable for long journeys and flights. Long sleeved shirts like Jeanne and Wilson are ideal for the beach whether combing for shells or sat at the bar. Leave open and roll sleeves with board shorts and bikinis and then roll down at lunchtime when you need extra protection from harmful UV rays. Instantly lift into evening territory with smart shorts or trousers, deck shoes, sandals and jewels. 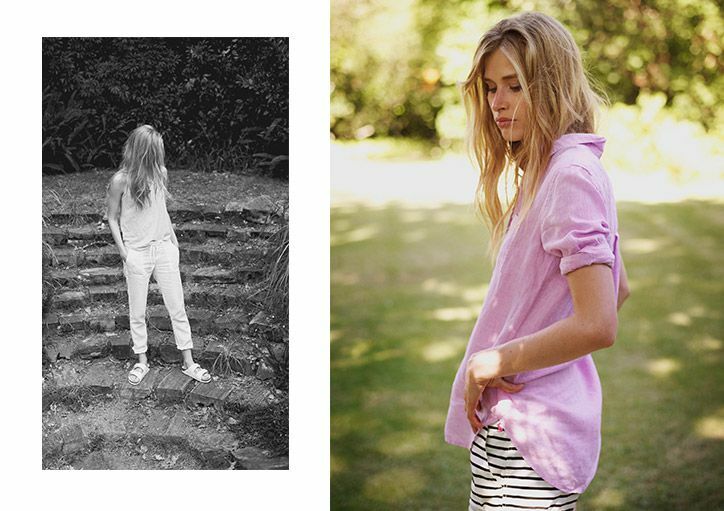 Our striped Inez frock is the ultimate alternative to a kaftan, too. Linen is perfectly acceptable for summer’s smarter social affairs too. For race days style the fluoro trimmed Lena shift with a clashing hat, jacket, woven clutch and wedges. Try our Caltha blazer over your finest lace frock for weddings and for the gents, the fine pink grid print of our Wilson shirt looks more than a little bit dapper with a navy blazer and chinos at Goodwood.